Disney Studios “The Lone Ranger” will hit theaters on July 3, 2013. Jerry Bruckheimer Films and Walt Disney Pictures have begun principal photography on the star studded feature film “The Lone Ranger”. Shooting is taking place in New Mexico, Colorado, and Utah through July 20, 2012. The casting director is seeking Caucasian men and women, Native American men, and Asian men to work as extras. 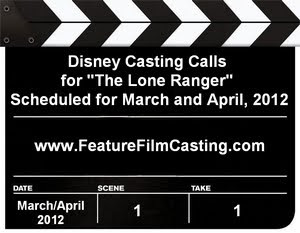 Open casting calls are scheduled for March and April, 2012 in Colorado and Utah. New Mexico open casting calls have already taken place. Gore Verbinski, who is best known for directing Johnny Depp in the first three Disney “Pirates of the Caribbean” films, will again direct Depp in “The Lone Ranger” from an adapted screenplay written by Justin Haythe. Verbinski’s Blind Wink Productions has been brought on board as one of the production companies and Classic Media will distrubute “Lone Ranger” overseas. Jerry Bruckheimer, who has won 7 Primetime Emmy Awards and is currently on the National Board of Directors of the Producers Guild of America, is producing “The Lone Ranger”. Chad Oman and Mike Stenson will executive produce for Jerry Bruckheimer Films. Three time Academy Award nominated actor Johnny Depp has described the film as an update on the television series, with the screenplay focused more on him as the sidekick Tonto. Depp has stated that Tonto’s role will challenge ideas about Native Americans that were portrayed in the original television series. Armie Hammer plays John Reid/The Lone Ranger. Hammer recently co-starred along with Julia Roberts and Lily Collins in The Brothers Grimm version of Snow White titled “Mirror Mirror” which is set to be released on March 16, 2012. James Frain will be playing a hard-nosed foreman who works for the story’s chief villain, railroad tycoon Latham Cole, played by two-time Academy Award nominee Tom Wilkinson. Frain’s character oversees Chinese and Indian rail workers. British actress Ruth Wilson has been cast as Rebecca Reid, who is married to Dan Reid, head of the Texas Rangers and older brother of The Lone Ranger. Other Lone Ranger cast members include James Badge Dale as Dan Reid; Academy Award winner Timothy Hutton; Golden Globe nominated Canadian actor Barry Pepper (The Green Mile) as leader of the seventh cavalry Captain J. Fuller; Dwight Yoakam (Sling Blade) as Butch Cavendish, the villainous leader of the Cavendish gang that attacks the Texas Rangers; and two-time Academy Award nominee Helena Bonham Carter as the madam of a brothel who deals with gentlemen and scoundrels. • Caucasian men and women, 18 years of age and older, all types. • Native American men, 18 years of age and older. No facial hair. • Asian men, 18 years of age and older. • No prior experience is necessary. • These are fully paid positions. • There are NO fees to attend these open casting calls. • MUST be located within reasonable driving distance casting call locations. • MUST have a social security number and valid ID. • MUST be legal to work in the United States. Foreign talent may be able to obtain work permits for the U.S. if they don’t already have them. If you fit the above, choose any audition time listed and do not be late. Show up at the mid-day audition times to avoid longer lines. • Bring a recent color a 3 x 5 snapshot, does not have to be professional. • No wigs, makeup or sunglasses in photos. Shoot it from the waist up. • Bring a pen or pencil. Be prepared to fill out a registration form with your contact information, address, and all clothing sizes including shoe and hat. Free parking is provided at each venue, however you should bring change for parking meters in the event that the parking lot is full. Please specify which area you live in and it’s driving distance to Creede, CO or Moab, UT. Write the name of your city on the front of the envelope, for example Attn: Creede Local hire/Pueblo resident or Moab Local hire/Cortez resident, etc. Please submit photos and resumes by mail only. New Mexico casting is completed. Do NOT send photos and resumes to the production companies, as they will most likely end up being thrown away. They do not cast the films, rather they hire casting directors who sort through the thousands of submissions. Left for dead in an ambush with five other Texas Rangers, lawman John Reid (Armie Hammer) survives and is nursed back to health by an Indian scout named Tonto (Johnny Depp). He then dons a mask to avenge the murders of his comrades and to foil evildoers, never accepting payment for his services. His gratis vigilantism is made possible by the silver mine he inherits from one of his slain brothers – the same mine that affords him his endless supply of trademark silver bullets. This film is using the working title of “Silver Bullet”. A working title is the temporary name of a film used during its development. Working titles are used primarily for two reasons – the first being that an official title has not yet been decided upon and the working title is being used as a filler for naming purposes, the second being to intentionally disguise the production of a high profile film. In some cases a working title may ultimately be used as the official title. This “title ruse” is now a very common practice by which these high-profile films or television series are given a fake working title to keep its production a secret, and to prevent price gouging by suppliers, casual theft and undesirable attention. The release title of this film will in all likelihood be “The Lone Ranger”.